So you just started a new WordPress site, what’s the first thing you should do? Well I’m going to show you why the first thing you should do is install a coming soon plugin and get a coming soon page up as soon as possible! I’ll show you all the benefits of a coming soon page. I’ll explain step by step how to get up and going, what to put on your coming soon page, why you should collect emails and what to do with those emails prior to launching your real site. So buckle up, here comes a lot of actionable information that will get your site traffic when you launch. Too many people still spend weeks (or months…) trying to design the perfect website and arguing over web copy, only to launch their brand new, beautiful website to the sound of crickets. I don’t want you to be one of them. That’s why I push people to get a “coming soon” page up on their site as soon as possible. You see, it takes time for a website to build up momentum. Social followings, search traffic, and email lists all grow like a snowball – in order to get the critical mass you need to sustain a successful website, you’re going to have to start small at first. But if your website is completely blank or under construction, there’s no way for you to capitalize on the people who are interested in what you’re working on. Emails are not the only important thing when laughing a new site, another critical part is whether or not people can find your site in Google or other search engines. Google is notoriously fickle about sending traffic to new websites. Unfortunately, SPAM is a reality of doing business on the internet, and Google has a team of people working around the clock to try to keep low-quality, spammy websites from clogging up the search results. They want to reward high-quality sites like the one you’re building – after all, helping searchers find the best websites is why Google became a household name. Putting up a Coming Soon Page will help your site get a jump start on getting listed by Google. I’m not just saying this, even Matt Cutts from Google Webmasters Team recommends put up a coming soon page as a “good thing”. If your website has the default WordPress Theme and initial default Hello World post that comes with every new WordPress site, Google is probably going to skip indexing your site until you get some real content. Putting up a Coming Soon page allows you to post real and useful content to your website visitors and allows you to hide the construction process of the real website. Google likes and recommends this approach as Mutt Cutts explains. If there is one thing I’ve learn is do as Google recommends when it comes to SEO. Finally, as I said putting up a coming soon page allows to to hide the actual nuts and bolts of building out your real site. Most sites takes months to build. Do you really want people coming to your new domain and seeing a half built site? I don’t think so! It’s not very professional and most people won’t return after seeing a site in an under construction disarray state. It’s best to put up a coming soon page and hide the working progress and release parts at a time when they are ready. So as you can see put up a coming soon page on your new WordPress site is beneficial to getting traffic and even necessary as far as Google’s SEO is concerned. I think a coming soon page can be pretty smart… … I think it can be a good thing for users and it can be a good thing for search engines. So you see how important it is to have a coming soon page, but how do you get people to give you their email address and why are emails so important? Email is so important because social media users are bombarded by a steady stream of notifications and messages and your message fades into the background. And that’s the best case scenario. Facebook has already dramatically restricted how many of your fans will actually see your posts, and there’s no way to know when the next change will diminish the value of those channels. Twitter is a constant river of messages and most people forget what they see in this stream of content. An email is personal and that allows you to build a relationship with your visitors. But to get people to hand over their email address, you’re going to have to give them a compelling reason to believe that your site is something to look forward to. Unfortunately, this is where most people run into trouble – there’s a big difference between promising your visitors something if they sign up for your list, and offering something that they’re actually going to want. There are a few things, though, that customers seem to enjoy in every market – discounts, case studies, and guides. There are a few things that customers seem to enjoy in every market – discounts, case studies, and guides. Everyone loves to get a good deal, but they also love being part of a group. Assuming you’re going to sell something on your site, promising a unique, one-time-only discount to anyone who’s on the waiting list before the site goes live. Even if people aren’t sure they want to buy what you’re offering, they’ll join your list so that they don’t miss out on a special opportunity and you’ll have the chance to convince them your work is valuable before the site goes live. One of the best ways to sell your product or service is to show how it’s helped people in the past. But you don’t have to wait for the full version of your site to go live to demonstrate how you’ve helped people in the past. Readers love specific stories about people like them. So whether you’re selling software, training, or a community, a case study showing how your solution has helped people in the past will both encourage people to subscribe to your waiting list, but filter out random browsers so you have a strong list of prospective customers. And last but not least, offering an email mini course or e-book guide can be a great way to both get people to join your waiting list, but also introduce them to your work and demonstrate the value you can offer before your site is launched as well. Focus on really helping your audience and keeping your content focused on teaching. By the time your audience has been exposed to a few hundred words of your teaching, they’ll be excited to see the next email announcing your new project is finally live. But now that we’ve turned your “coming soon” page into a mini-funnel for your waiting list, we need visitors to show your offer to. …the magic question, of course, is: How? Well, the short answer is traffic. Now, some of you will want to use Facebook ads to drive traffic to your lead magnet – that works great if it’s something you can afford. But for many website owners, running a bunch of advertising is either cost prohibitive or not something they want to risk on a new project before they see evidence that the site is going to get some kind of traction. That’s fine, because the bootstrapper’s approach to exposure is actually a lot of fun. If paid advertising isn’t in your plans or your budget at the moment, the best way for your to build excitement about your new project and is to go on a good old fashioned media tour. But instead of targeting tv, newspapers, or magazines, you’re going to be pursuing guest posting opportunities, podcast interviews, visit forums and other online communities where your target audience hangs out and even reaching out directly to people and influencers in your industry to help get the word out. Now, in order for this strategy to get much traction, you need to have some kind of experience or expertise that you can share with those publishers’ audiences. And this doesn’t have to be the rags to riches story of how you built a global startup out of your college dorm room – people are much more interested in personal stories and specific case studies as we discussed. But it’s going to take a little bit of effort to refine your pitch. When in doubt, look for past experiences where you can offer a good lesson that you learned that will be helpful to your target audience, or a difficult experience you think they will relate to. Then just start chatting with the influencers, bloggers, community moderators and podcasters on Twitter for a bit before sending a friendly email introducing yourself and floating the idea of making an appearance on their platform. Try to tie your pitch into something that they’ve written or published recently, or something else that you know about their brand. At the end of the day, this kind of outreach is a numbers game, but you’ll have dramatically better results if you do your homework and really get to know your targets, or restrict your focus to sites you’re personally familiar with – after all, no one wants to feel used. Be respectful of their time and their audience and try to craft a real win-win scenario for the publisher, their audience, and your list. Because, after all, you want to make sure to mention your mini-course, case study, or discount list at the end of your podcast or content piece. There are plenty of smart marketers out there who’ve used this strategy to add tens of thousands of interested prospects to their waiting lists before they ever launched their product or their site. Yes, it’ll take a little hustle, but it’s an amazingly powerful to build a great waiting list if you’re a little short on cash. So you have a coming soon page up, a great lead magnets and traffic. What do you do with those leads now? Well the first thing you should do is instantly send a Welcome Email after someone signs up for your list and tell them what to expect. All Email Marketing provider services like MailChimp, Convertkit and Drip provider the ability to send an email after someone joins your list. Here’s an en example of a Welcome Email. Thanks for subscribing to SeedProd! site and I'll be sending out a discount code as we get closer to launch. you get when we do launch! In the example welcome email we are welcoming visitors to our list and telling them what to expect as far as the frequency of our emailings. Also this email is using a discount code as a lead magnet. If you are not using a discount code then you’ll want to deliver your case study, ebook or guide in this email. So what’s next? After someone joins your list you don’t want to go into radio silence. You’ll want to email an update to that lead so they don’t forget about you at least once every few weeks. People love behinds the scenes updates and they wouldn’t have joined your list unless they were interested in what you have coming. So keep them posted with updates on your progress. Once you are ready to launch your new site you’ll want to send out a launch sequence of emails to build excitement. Obviously what you put in these will depends on your market and audience but here’s an example sequence and timing of those emails. We're almost ready for launch! Here's a video to show you what we have been working on. But hurry this code expires in 48 hours. want to personally than you for being part of our launch. code, it expires a t midnight tonight! Of course you can add or remove emails depending on your site type but you get the gist of what we are trying to do. We are trying to get the user to take action. OK I’ve given you all the info you need to build a success site launch. You might be thinking, “wow, this is a lot to setup and how do I set this up in WordPress”. It’s actually easier than you think! 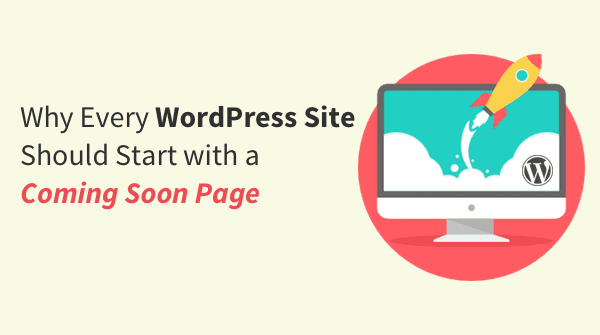 The best way to set up a coming soon page for WordPress is to use our coming soon page plugin. You can literally have a great looking coming soon page with the ability to collect emails and hide your WordPress site in minutes. It’s really a no-brainer considering all the benefits it provides. I hope you enjoyed this guide on how to set up a coming soon page for WordPress and why it’s important. I’ve seen this approach launch countless successful sites over the years, and if you follow the advice I’ve laid out here, I’m confident your next site launch will be a smash hit too. Thank you again for taking the time to read. Leave a comment below if you have any questions or want to share your experience and be sure to check out our coming soon page plugin. Try it risk free for 14 days.